Terrill and Munzing thrive while running tough defenses for Rams and Tigers. One draws up a defense that spearheaded a run through the Class C South playoffs last season. The other orchestrates one that has been the nastiest bunch in the Pine Tree Conference this fall. 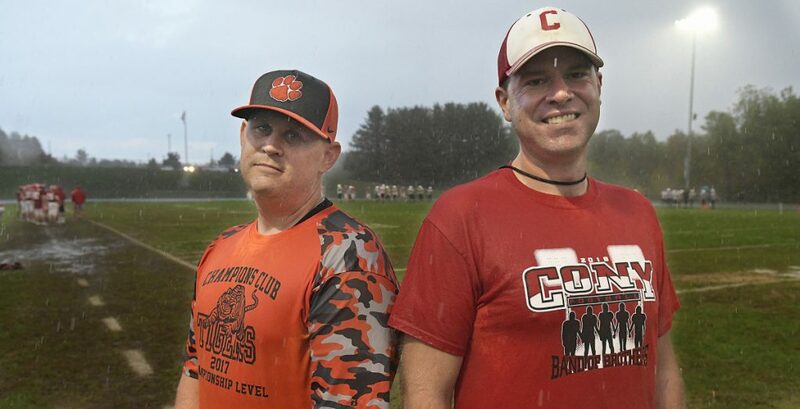 When the Gardiner and Cony football teams meet for the 141st time on Friday, they’ll do so while boasting defensive coordinators that have made names for themselves as two of the brightest minds in the game. Running backs have learned to expect a pounding when going up against Patrick Munzing’s Tigers. And quarterbacks have grown to fear facing Brandon Terrill’s Rams. Munzing said he enjoys the challenge as well, both of drawing up schemes and then figuring out how to place his players within it. It’s a test they’ve been acing of late. With Terrill calling the plays, Cony has allowed 8.8 points per game, the best figure in Class B North and the second best in all of Class B. Gardiner’s defense under Munzing has been less consistent this season, but it has shown flashes of being the unit that allowed 21 points over the three games leading up to the C South championship game. They help coach the longest-running adversaries in the state, but there’s more that binds Munzing and Terrill than separates them. Both are from football families, and have taken a tactical approach to the game since their childhoods. Both have preached speed and aggression with their steadily improving defenses. Both are under 40, with plenty of miles left in their football roads — and are happy to be where they’re at right now, turning in one game plan after another that impresses his head coach. For Munzing, the path to coaching began early. His father, Rob, was the Gardiner head coach from 1986-1999, and his brothers Andy and Nate both went on to play college football. Patrick himself played at Maine after three years at Gardiner, and quickly felt the pull of the sideline after his playing days were over. Munzing became a JV coach at Gardiner, then was running the offense for the varsity team in 2015 under first-year coach White. Drawn more to defense, Munzing pitched a swap in responsibilities. The Tigers struggled in Munzing’s first year but found a rhythm last year, turning into a physical unit that slowed running and passing attacks alike. Munzing kept things simple, knowing his best defense was one that was reacting while moving forward rather than spending time thinking and standing still. White said Munzing’s impact on the team has been clear. Terrill played at Orono from 1998-2001, and gained an interest in the strategic side of football along with his older brother Barry, currently the head coach at Washington Academy. After coaching at Orono, Terrill took an English teaching job at Hall-Dale, joined the Cony staff in 2013 and became the defensive coordinator the next year. The Rams took a step forward last year, turning into one of the PTC’s best units, due in part to Terrill using the first three seasons as a learning experience. Cony’s defense now reflects that tenet, with Nic and Jake Mills leading a relentless defensive line, Matt and Mike Wozniak anchoring an athletic linebacking corps and Reed Hopkins serving as the linchpin of a ballhawking secondary. “We have all three levels of the defense doing something on every play,” he said. “Up front we might do a stunt, in the middle level we’ll have a blitz on and in the third level, we’ll get to the point where we’ll show one coverage and then execute a different coverage post-snap. It’s been working so far.